Here's the latest of our custom designed stationery - Save the Dates for Jessica and John. 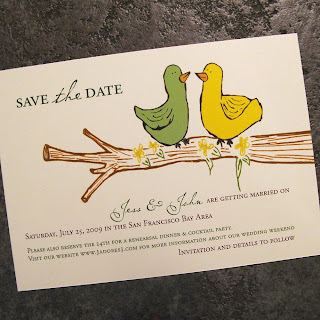 The couple chose a sweet whimsical graphic of love birds for the theme of their save the dates. They were flat printed on a warm white card stock in the colors of their nature inspired wedding this summer. To complete the look, we addressed the matching envelopes with our digital calligraphy, matching the font and color of their names. Next up... the wedding invitations!